My son plays TV games for Xbox360 and the cable of the controller has broken. He told that his friends used Ni-H batterries for the controller. The controller has wireless function. His freinds did not replace the cable, as it is expensive. My son bought two Ni-H batteries. I told him not to buy a charger because I can charge them by my power supply. I recommend him to buy spares. I charged them measured by panel meter of my big power supply at first. I happned to test Eneloop and Evolta one another. I attached two testers for measuring current and volt. One is an old analog tester which was given by my father a long time ago. The tables shows the records of charging a pair of Ni-MH batteries for Eneloop and Evolta each. I usually have charged two Evolta batteries that stays at little charging current for a day or two days. I found them very warm. They broke down, because I applied too high voltage or did not stop charging at the little current. I bought two Eneloops for broken Evoltas. I measured voltage of two Eneloops, when Xbox360 controller did not work. The controller controls Xbox360 by wireless. Their voltages were 1.189V and 1.188V by Sanwa PC510. I think that termination voltage is 1.2 V not to feed current for Xbox360 controller nearly. If charging termination voltage is 0.2 V higher as lead battery, application voltage of two series will be 2.8 V. Charging currents were 20 and 50 mA, when I applied 2.4 and 2.5 V. I began charging at 2.6 V. The current was 70 mA. The table shows the result. I increased application voltage at 2.67V, so the current increased at 65 mA. I started the test at 15:36 on 1 Febrauary and finished at 13:39 on 2 Febrauary. I measured open voltage of the batteries that were 1.315 V. They applied Xbox360 for a few minutes. The open voltage dropped at 1.305 and 1.310 V each. I charged another pair of Eneloop. The open voltage were 0.997V and 1.077V before charging. After the charge, the both batteries were 1.341V. The another pair of Eneloop discharged at once. I increased application voltage. The pair of Eneloop open voltage were 1.128V and 1.148V before charging. After the charge, the open voltage were 1.371V and 1.370V. Current indicator fluctuated a little, when it indicated 30mA. I marked number of 11 and 12 for dissipated ones at once. The open voltage of 11 and 12 were 1.174V and 1.183V. I decreased application voltage that showed 2.88V. The Alinco power supply output may drift. The current indidcator fluctuated a little at the stage of 20mA. The charged open voltage of 11 and 12 were the same 1.387V. As max output voltage of DM-310MV is 15V, 0.1V is 0.6%. Usually power supply may allow a few percent of max output. I had better check power supply for Eneloop batteries to do more pecise test. 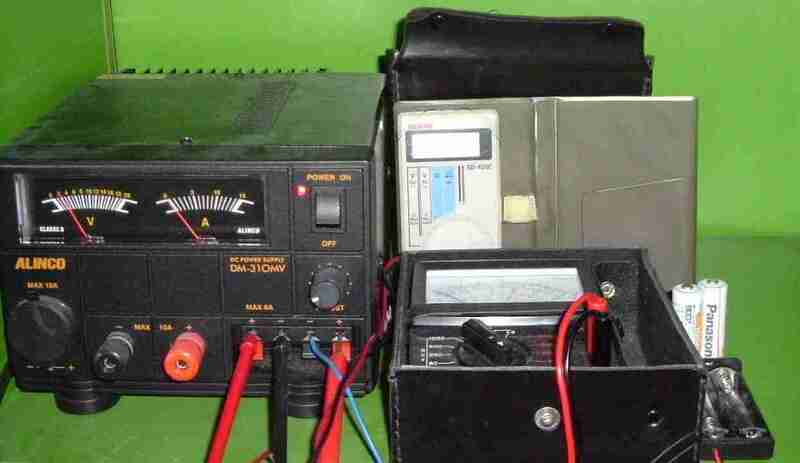 I have continued the same measuring condition, when I had used another output terminal of power supply Alinco DM-310MV to measure allication voltage of Evoltas and Eneloops. 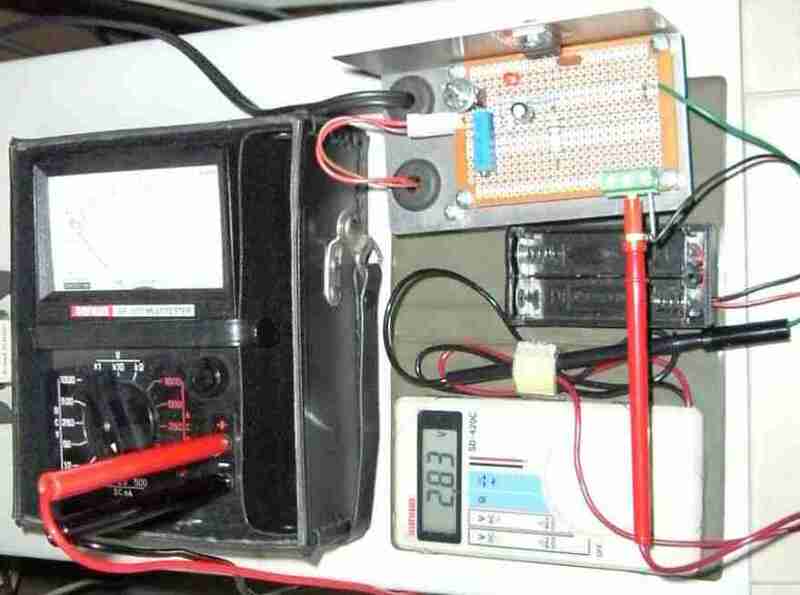 I was to measure true application voltage excluding voltage drop of the current meter. Instead of it, I have to pull out the plus probe of SD-420 and push into another jack to measure the supply voltage. I charged the broken Evoltas. The table shows the result. The open voltage of charged Evoltas were 1.423V and 1.425V. My hand-made regulator drifted at 0.01V during 18h 13m. Otherwise power supply Alinco DM-310MV may drift at 0.03V quickly. I also charged Eneloops at the same power supply voltage. I lowered my hand-made power supply voltage from 2.87V to 2.83V because I worried about overheat by excessing application voltage. The table shows the result. It took a long time to get charged voltage more than 2.8V. It took 24.7 hours. I started to charge Evloltas at 2.81V of power supply. I tried the broken Evoltas to finish charging at 2.82V. They could use batteries for XBOX360 controller. I found more than 2.8V necessary for XBOX360. Although I charged for a long time, the application voltage was 2.78V. The current meter indicated 35mA at 500mA range. I was doubtful why the application voltage did not rise up in spite of 35mA. I tried 25mA range of Sanwa SP-10. Oh, it indicated only 5mA. I confirmed measuring voltage across a resistor for current measuring and excess protection by Sanwa PC510. PC510 measured 3.93mV that meant 3.93mA for nominal 1 Ω. I increased power supply voltage after 7h 36m. ** It was 2.83V. I increased 2.85V. I think that impedance of 25mA range is larger than 500mA range. I also measured at indicated 25mA. The table shows the result. Impedance of 25mA range is larger than 5.6 times. It took 23.5h to get application voltage 2.81V. The open voltage of power supply was 2.84-5V. I happened to find that a site measured characteristics of discharg below 1V. Eneloop seems to break at 1.1V, when it loads 5Ω. I find that Xbox360 controller stops working at 1.1-1.0V. The design is reasonable, I think. I knew that Sanwa SD-420C measures little than Sanwa PC510. I tried charging a pair fo NiCd batteries which I bought a few years ago. I measured the open voltage of them by PC510. They were 1.112V and 1.055V. I began to set up TDS310 with my tiny regulator. Measuremtn of TDS310 showed 2.87V of open power supply voltage, otherwise SD-420C was 2.84-5V. PC510 showed 2.873V for the same voltage. As the result of measurement of power supply, I trust PC510 and TDS310. I removed Sanwa SD-420C and SP-10D from the measuring system. I ran TDS298, Kiri198 and Slip2 on WindowsXP Home of 400MHz PC. I tried charging two NiCd batteries and got listing of application voltage at every minute. I was surprised at less than mV order noise. I show the measuring setup of TDS310. I selected low sampling rate 2kS/s to lower A/D noise, but I did not select Tek Roll. It is too slow to display at real time. I could select 256 averaging, because signal change is very slow. M1 and M2 showed high resolution by 256 average. I have attached to a protection resisitor of 1Ω, so difference from M1 and M2 is voltatge drop by the resistor. The NiCd battery spent 70mA even at 1.4V. It took only 1h 33min. Don't NiCd and alkaline batteries apply for Xbox360 controller? I have some NiCd batteries. I had charged two NiCd batteries at more than 1.4V. I passed them for Xbox360 wireless controller. They ran out when my family saw DVD at once. I measured the open voltage of them, 1.220V and 1.120V. I do not know why they dropped the voltages at once. My wife gathered used alkaline batteries which were used for Xbox360 controller at home. I picked up them and measured the open voltages. I marked them numbers. They were No.1 1.251, No.2 1.251, No.3 1.239, No.4 1.252, No.5 1.254 and No.6 1.255V. All the six batteries were more than 1.25V. Why did they supply enough current? Their expirate term was December 2010. Is internal resistance very large because they were old? Their brand was Fujitsu. Forward voltage of diode is about 0.7V, Loss of collector-emitter of transistor is 0.3V. The load of 2Ω was too small. A used alkaline battery might run within a few mA usage. I show the listing by Slip2. TDS298 ver1.01.0004, Kiri198 ver1.00.0031 and Slip2 at design time worked well for nine hours on Window98 of 400MHz PC.